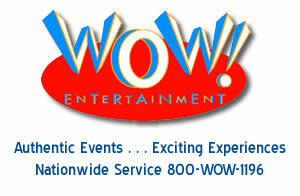 The photo booth an item that propelled WOW Entertainment into existence in 1997 and was used on events for the next three years has been updated & overhauled for weddings, trade shows, corporate events and other social events. The Foto Morphosis photo booth currently has three unique features for guests to enjoy at their event. The most popular feature is the Gene Machine which allows either one guest to or two guests to morph their images to look into the future to see what their child will look like. Unlike in real life, the guests choose the gender of their future child as well as the hair color and ethnicity of their child. Among the ethnicities offerred are Caucasian, African American, Hispanic, Indian as well as Asian. The 2nd feature of this sitdown photo booth is Instant Makeover. In this feature guests have the opportunity to choose from a large variety of hairstyles and costumes and see how they would appear with them. The last feature is Magic Morph where guests have the opportunity to morph their image with pets, wild animals as well as presidents. 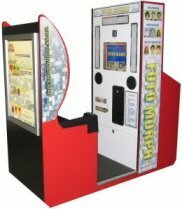 This photo booth allows for numerous customization features such as on the print out of the picture, messages appearing during the game play as well as customization of the exterior lightboxes and signs. A great choice for weddings as well as social & corporate events let the Foto Morphosis Photo Booth WOW your guests at your next event.